Saturday dawned - blue sky, sunshine, no snow. Ah, a full day's competitive big band action to look forward to! The first person your correspondent saw upon entering the grounds of Park View Community Centre was Bill Watson (Festival Director, Great North Big Band Jazz Festival) heading off-site running an errand - the man's day is seemingly a busy one from first light! And there's Alexis Cairns, among the first of Dave Hignett's Tyne Valley Big Band crew to arrive. Yes, it was going to be a busy day. How best to review an event such as this? Such-and-such a band from wherever won, the rest also-rans...or take it in something like the order events occurred? Tried and tested, stick with the latter. Shortly after eleven o'clock Saturday morning, the Open Section of this year's GNBBJF got underway, as usual, with Newcastle University Jazz Orchestra (MD Daniel Wilson) leading the way. Twenty or so minutes to impress the adjudicators - Messrs Mick Donnelly and Marcus Brown - NUJO got cracking. 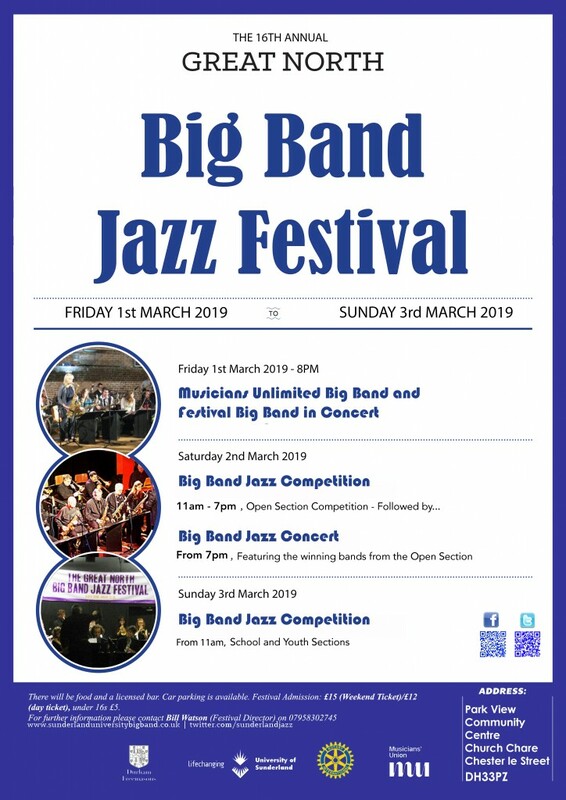 A couple of months ago, on hearing NUJO band members sitting in at a jam session, BSH Editor in Chief, Lance Liddle, suggested the band could be in with a chance of winning silverware at GNBBJF 2019 - we would see. Matt Green, alto, Tom McDonald, trombone, James Cuxson, guitar, they were there, playing their part in a varied set, from Over the Rainbow to Council Grove Groove. Durham University Big Band (MD Honor Hornsby) arrived bright eyed and bushy tailed (including Zach Fox, tenor, and Tom Burgess, guitar) to present a set commendable by way of contrast - Oliver Nelson's Step Right Up to Alfa Mist's Breathe featuring vocalist Evie Hill, Ms Hill recalling her DUBB predecessor Laura Paul interpreting J Dilla. The Tyne Valley jazz scene is thriving (Hexham Jazz Club at the Fox Inn, the Vault's regular promotions, Giles Strongs' promotional endeavours) and the vanguard - Tyne Valley Big Band (MD Dave Hignett) - turned up in great number. Approximately thirty musicians on stage, the band's approach one of inclusivity, Alexis Cairns led the way with several others standing in the soloist's spotlight. Apple Honey (a sure-fire rip-roarer) to Tito Puente's Oye Como Va to Gordon Goodwin's The Jazz Police, TVBB, as usual, had some fun. Wakefield Big Band (MD Andrew Shilton) made its debut at GNBBJF2019. The band's version of Sussudio succeeded, for the most part, in banishing any thoughts of its composer (P. Collins) and Bob Florence's bona fide jazz chart Carmelo's by the Freeway showed what the band could do. 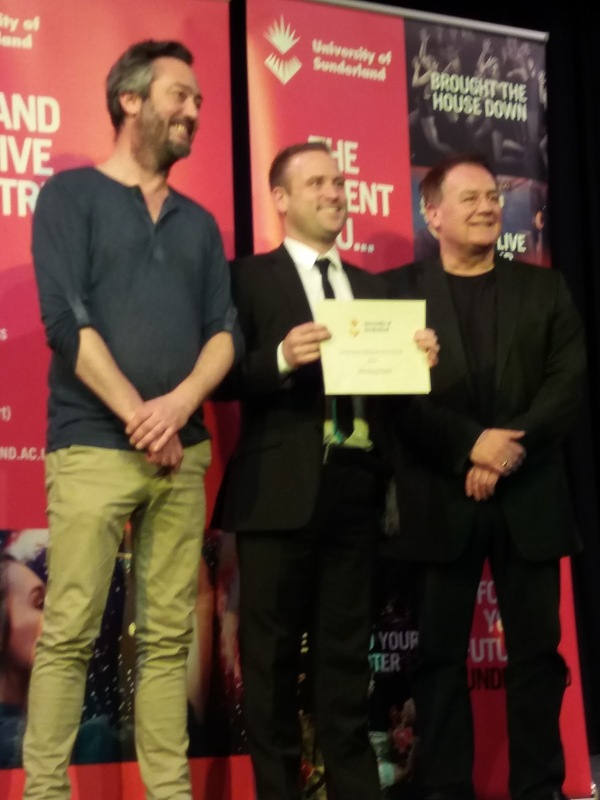 Some bands support the Chester le Street event year in, year out and one of them is the award-winning Durham Alumni Big Band (MD Shaune Eland). To describe the band as 'accomplished' doesn't tell half the story, DABB is an outfit boasting several stellar soloists and at least four of them stepped up to the plate; Jonny Dunn, trumpet, Alex Baker, tenor, Terry O'Hern, trombone and Steve McGarvie, alto. Dunn, in particular, shone on John Warren's Destination Unknown (arr Steve Waterman). This was impressive playing by Dunn, would the trumpeter and his colleagues be in the shake-up? One sage judge suggested DABB was the best yet, although there was a long way to go. The Wigan-based Infinity Jazz Orchestra (MD Chris Langford) made a welcome return to the arena. The band's programme promised to be an enjoyable experience - Birdland, Makin' Whoopee, Alexander's Ragtime Band and Gordon Goodwin's The Jazz Police - and so it proved. Ewan McNeil's bass trombone feature on Makin' Whoopee made fellow bass 'bone men and women of the Bass Trombone Union sit up and take note. West Yorkshire coach companies relish the first weekend in March. Leeds doesn't enter one big band, it invariably sends a battalion. This year three bands piled onto their away-day coaches and duly took to the Park View stage one after the other. First up, Leeds University Union Big Band (MDs Daniel Proctor and Matthew Robinson). Luton Hoo impressed, as did Mark Taylor's Brass Machine featuring Matthew Robinson's trumpet playing. 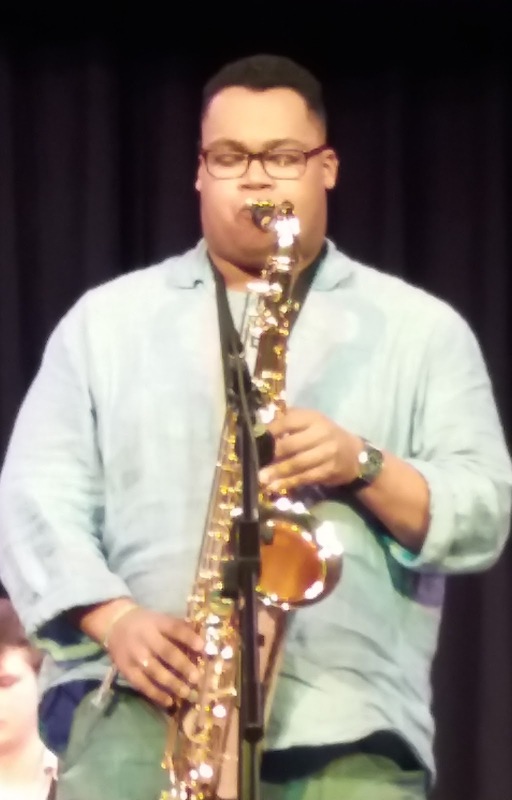 Robinson has come a long way - from Durham County Youth Big Band to Durham Alumni Big Band to undergraduate studies in Leeds. 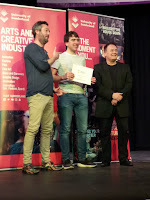 Leeds College of Music Student Union Big Band (MD Callum Quinn) joined the party. Four ace numbers - Orange Colored Sky, Doin' Basie's Thing, My Favorite Things (arr Paul Jennings) and Mingus' brilliant riposte to the clown who once held public office in Arkansas, Fables of Faubus - ensured the orchestra's set was well received. The third of the city of Leeds' bands - Leeds Jazz Orchestra (MD Colin Byrne) - presented an all-Mingus programme. Free-wheeling, at times seemingly chaotic, no doubt just as Mingus intended, this was an eminently listenable set. Gunslinging, Don't be Afraid, the Clown's Afraid Too and Jump Trump (Colin Byrne mischeviously retitling Jump Monk! ), this piano-less outfit hit the spot. From across the Pennines, the Red Rose county responded with a further three entrants. The first of them could rightly be described as 'entertaining'. Manchester University Jazz Orchestra (MD Sam Walker) opted for a four-song, that's 'pop song", attack. Potentially cheesey, think Beats & Pieces and you'll get an idea of where these sneakered boys and girls were coming from. ABBA's Lay All Your Love on Me (arr Sam James and Sam Walker), the Jackson Five's classic I Want You Back (arr Sam Walker), Phil Collins-Philip Bailey's Easy Lover (arr Sam Walker) and the Weather Girls' It's Raining Men (arr Sam James) had 'em singing along if not boogie-ing in the aisles. Katie Emmanuel sang and the boys in the band chipped in with a few instrumental solos. LIPA Big Band (Danny Miller) made a return visit to Chester le Street beginning with an up-tempo take on Misty. Over the Rainbow was heard for the second time during the day, Sonny's Place featured the two altos of Josh Phillips and Arthur Guisan and the band's closing number just had to be a number from the back catalogue of LIPA's lead patron Paul McCartney - She's Leaving Home. Last, but by no means least, the Managers Big Band (MD Ben Shepherd) took to the stage. Emphatic winners of the GNBBJF 2017 (last year's event fell victim to the Beast from the East) the Bolton-based band performed to a, by now, full house. All of the other bands wanted to witness what was about to unfold. In an earlier BSH preview, your correspondent suggested the band should be considered among the ante-post favourites. We were about to find out. Rhapsody in Blue and Channel One Suite formed the programme and from the first note we were listening to something special. Dynamic isn't the word, the Managers Big Band is as good as it gets. The five-strong reeds were top notch clarinetists - yes, all five of them playing together with the award-winning Emily Burkhardt the key soloist - alongside the brilliant tenor saxophonist Kyran Matthews. Drummer Alan Taylor is a mighty player and did Buddy Rich proud on the band's second, and closing, number. The Managers' ensemble precision is something to behold and the soloists are absolutely grade A calibre. Applause frequently rang out across the hall, much of it led by fellow competition band members - they knew they were listening to something special. The adjudicators retired to make their final deliberations. 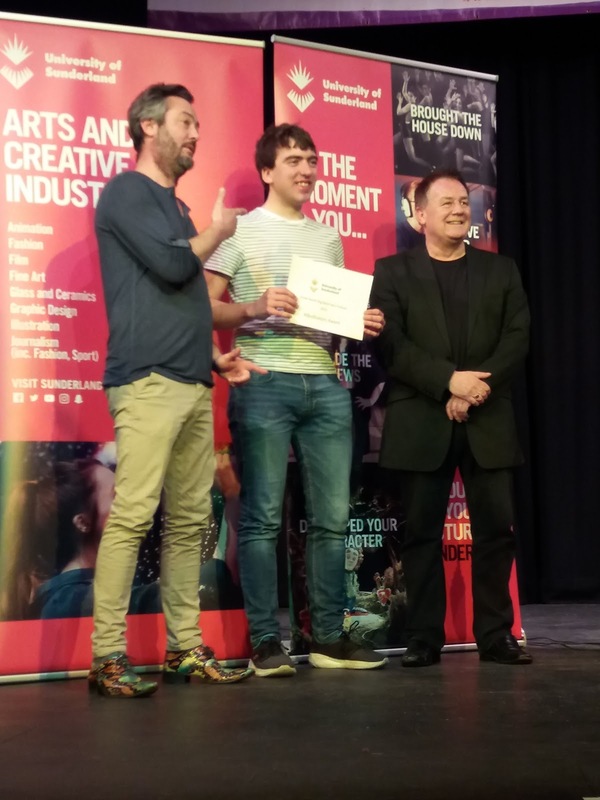 An expectant hall welcomed Mick Donnelly and Marcus Brown to the stage. 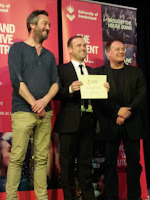 The awards were announced by Bill Watson with Donnelly and Brown presenting the winners with their certificates (photos were taken to document the occasion). The day's events are, perhaps, best summed-up by big band aficionado Tony Eales who said: This was the best day of big band jazz I've ever heard and that includes numerous visits to major big band festivals in Los Angeles and Las Vegas.